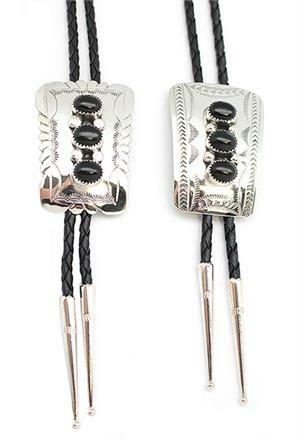 This sterling silver rectangle shape bolo tie has three 10x12mm black onyx stones with stamping and has vinyl straps measuring approximately 44'' long end to end with sterling silver tips. It measures approximately 2" long by 1 1/2" wide at widest and tapers down. Crafted by Navajo artisan Wilber Meyers. Available with a straight edge, no cut scalloped edge available at this time. Stamping will vary.